Scientists use the term climate change to describe long term trends in the earth’s climate. They have gathered data from around the world – from modern satellite measurements to records of tree rings to gases trapped in ice shelves tens of thousands of years ago – which confirm that the earth is getting warmer. 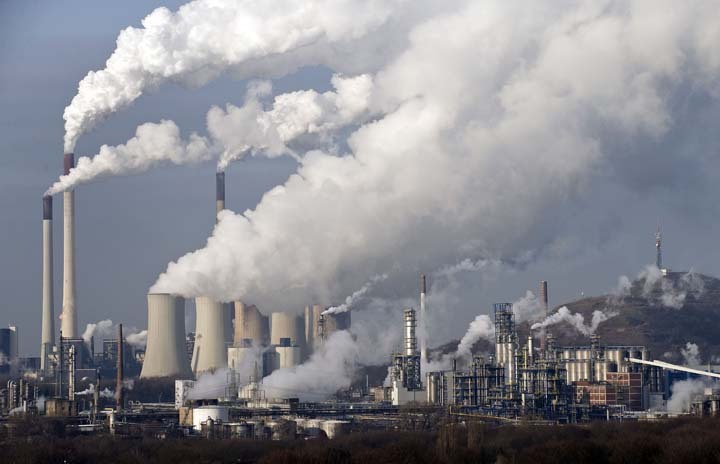 Nearly all of the scientists that study these data agree that global warming is happening because heat-trapping gases, known as greenhouse gases, are being added to the atmosphere by human activity. Warmer temperatures resulting from the continued build-up of greenhouse gases are causing visible changes around the world, such as melting glaciers, rising sea levels, and intense flooding and droughts. These changes are happening because the earth’s air, water, and land are all linked together in Earth system cycles, like the water cycle and the carbon cycle. It’s true that the earth’s climate has changed before, and many times, but the change that we are experiencing today is different. This change is happening more rapidly than at any previous time, because humans are putting greenhouse gases into the atmosphere at an unprecedented rate. Source: U.S. National Park Service. 1883 photo: USGS/Israel Russell. 2015 photo: NPS/Keenan Takahashi. See more Images of Climate Change and get more information on the causes and impacts on NASA’s climate page. Nobody can look into a crystal ball and predict the future with certainty, however, scientists can make estimates about future population growth, greenhouse gas emissions, and other factors that affect climate. They can enter those estimates into computer models and run simulations based on different scenarios in order to determine possible consequences of climate change, and find out which outcomes are most likely to occur. 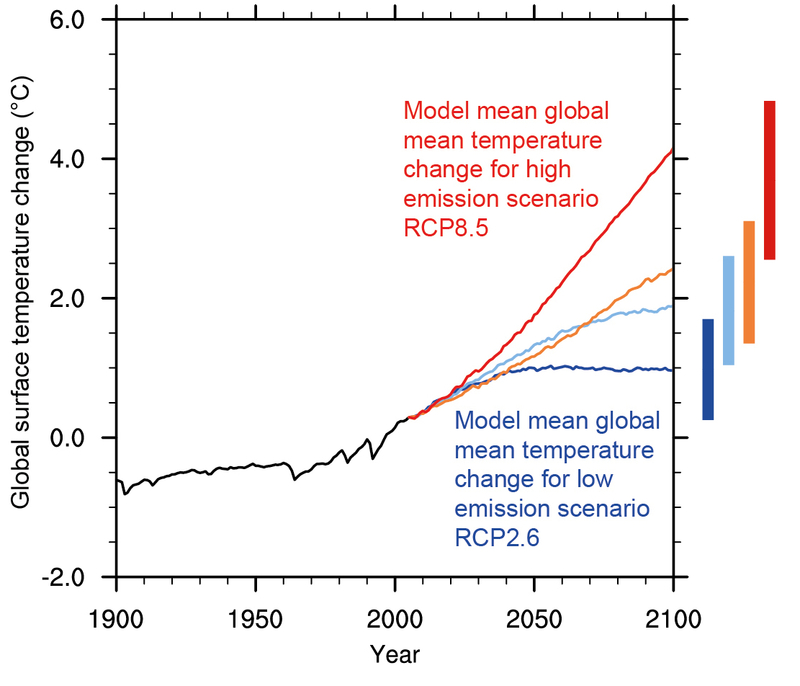 This graph shows the range of temperatures projected by different climate model scenarios. When scientists talk about uncertainties regarding climate change, they are referring to the range of outcomes based on data and all of the scenarios in the climate models. For example, we DO know that climate change will make the world a warmer place; we just don’t know quite how warm it will get. That is the uncertainty. We DO know that as the earth warms, and glaciers and ice caps melt, the sea level will rise; we just don’t know quite how high. There is greater uncertainty in human behavior – we don’t know how humans are going to react to the changing world. Will we take steps to mitigate climate change? This will have an impact on the severity of the consequences we face around the world, and here at home. To learn more about how climate models work and future climate projections, visit the archived EPA’s Future Climate Change site below. To learn more about climate change in general, visit the Climate Communication page, a website dedicated to communicating the complexities of the latest climate research in plain language. The Dallas City Council approved funding for a Comprehensive Climate and Environmental Action Plan (CECAP) in September 2018. Dallas Environmental Quality and Sustainability is leading this effort that includes various stakeholders across Dallas. Learn more about CECAP and get updates at www.dallasclimateaction.com. You will need to have a browser capable of viewing iframes to see the content below.